​Major advancements have taken place in the manufacturing of highland bagpipe pipe chanter reeds. Gone are the days whereby reeds were made using an almost exclusive hand finishing process on tools fashioned out of simple materials; the boom in numbers of people learning to play the pipes in recent years coupled with the general advancement in playing standards across the world has meant that reeds must now be made faster, and more efficiently, and at a level of quality much superior to what was deemed passable only a few years ago. Because of this, reedmakers nowadays generally have invested in advanced machinery and tooling which has seen the quality of reeds rise dramatically and also the consistency of different types of reeds is now at a high level. Pipers now have a choice from what remains a small number of manufacturers who almost without exception produce consistently good products which are functional and reliable. The most important material in the making of chanter reeds is the blade material which is cane, a derivative of bamboo, which is grown in the Mediterranean regions of Spain and France. The suppliers of cane for all musical instruments have kept pace with the general recent advancements in the reed manufacturing industry, and so the quality and selection of arundodonax has been high in the past decade. 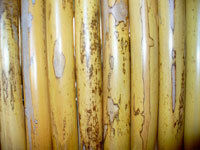 The cane comes to the reedmaker as selected and graded tube cane, and is of a fairly uniform standard of good quality. Good reedmakers will keep the cane stored in suitably controlled conditions for a period of some months to ensure that it has seasoned properly and then will go through the stock to further select material that meets a standard of hardness which ensure that the finished reeds are bright and consistently balanced.In general, bagpipe chanter reeds are made in two basic configurations, or profiles. Both types are popular for different reasons. There is what has been termed the ridge-cut profile, and also the flatter sanded profile. The fact is that almost universally these days reedmakers use a sanding method to produce both types of reed, as opposed to the old-fashioned chisel and block type of hand manufacture. Different pipers often prefer one type over another, although the sound and tone of both are often very similar. Perhaps these days the term “plug and play” has become overused, but if you are able to develop the basic skills employed in selecting reeds you should quite easily get a lovely tone with a minimum of fuss. If a reed produces the proper sounds when blown in the mouth, there is every chance that it will perform and pitch properly in the pipe chanter. Reedmakers spend a great deal of time and thought in the initial design and geometry of their reed. To the eye, there can be little difference between one maker and another, but the relationships between the different dimensions are minuscule. In particular, the dimensions and relationship between the size of the waist of the reed where the binding finishes at the top of the staple and the breadth of the lips at the top of the reed is particulary important. Overall length of the blade coupled with just the correct thickness overall also combines to determine an overall profile and shape which characterises an excellent design. Added to this mix is the manufacture and design of the staple, which must also be complimentary and work in conjunction with the design of the blades. In short, there are many interconnecting variables which contribute to the success of a reed design, and if only one of those becomes altered or disturbed by even a fraction the difference in the tone of the reed can be detrimentally affected. Virtually all makers of bagpipe reeds today ensure that they maintain the highest possible standards of finishing. In previous times, it was important to examine reeds to make certain that the blades were of identical profile, that the tying was neat, and that the staple was properly constructed and formed. Fortunately in today’s market, these inspections are mainly unnecessary, such is the quality control exercised by almost all manufacturers. It is important for pipers to obtain reeds which suit their individual playing requirements as regards blowing strength. Try to select reeds that for all extents and purposes are very close to the blowing resistance which you will play the reed at. There is no need to select reeds which are hard to blow in the hope that they will weaken through time and settle to an easier blowing strength. Good reeds will continue to play in tune at the same strength as they were when selected, and will take little “blowing in”. All that should be required is a touch, perhaps a squeeze here and there – a far cry from the old days when pipers hoped to obtain a few reeds from a sizeable batch and even at that found that much expertise was needed to essentially rework the reed in order to get it to perform satisfactorily. When first testing the reed, it is helpful to know what sort of sound is suitable and desirable when the reed is blown in the mouth outwith the pipe chanter. Experience will be a telling factor here, but suffice to say that one is looking for an even, “throaty” crowing sound. The sound should not be shrill, and the reed should vibrate freely. A point not often noted is that as soon as air is impacted onto the reed, it should begin to sound. Very often a reed will allow a fairly sizeable amount of air to be passed between the blades initially before a sound is emitted. The best reeds are immediately responsive as soon as air is blown through them. Often, when the pressure is increased from the mouth, perhaps above the blowing strength require when you play the reed in the bagpipe, the crow will gradually disappear and a more empty, hollow tone will sound. This is quite normal, and in my opinion, desirable. Advancements in reedmaking manufacture along with the technological developments in piping equipment has meant that pipers enjoy a much less fraught and demanding experience in setting up a well toned instrument which is a pleasure to play. Don’t forget however, that although the fine art of being able to coax the optimum tonal quality from inconsistent products has largely been alleviated, the art of reedmanship has not been totally lost. It is still important to be able to learn the basic skills so that the piper can adjust reeds so that they are just the right strength and pitch. Finally, there is no need to blow hard reeds - even the best pipers in Grade One bands are now blowing much easier instruments than they did just a few years ago. A bit of experience and experimentation will result in your being able to produce a good, full-bodied and true sound while playing without discomfort on a nicely set up instrument.